London meet says RSS, Islamic State, Taliban, European far-right "using religion for political supremacy"
Calling on people everywhere to form a International Front for Secularism and strengthen a human alternative to the religious-right, those who participated included Bangladeshi-born writer Taslima Nasrin, who has just been allowed to continue living in India, Indian labour historian Dilip Simeon, Southall Black Sisters director Pragna Patel, philosopher AC Grayling, Aliyah Saleem who spent six years in an Islamic school in Britain, prominent French writer Caroline Fourest, Pakistani-born human rights activist Kiran Opal; Iranian writer-journalist and documentary filmmaker Lila Ghobady, and others. The manifesto says that in the worldview of these far-right organizations, “universalism, secularism and citizenship rights have been abandoned and segregation of societies and ‘communities’ based on ethnicity, religion and culture have become the norm.” It adds, “For many decades now, people in the Middle East, North Africa, South Asia and the diaspora have been the first victims but also on the frontlines of resistance against the religious-right (whether religious states, organisations and movements) and in defence of secularism and universal rights, often at great risk to their lives”. 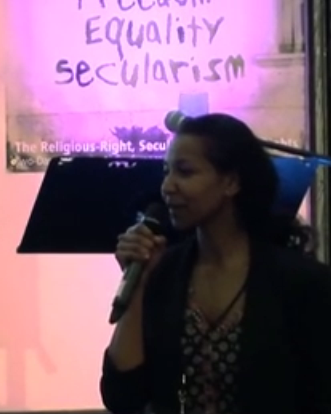 The manifesto calls upon “people everywhere to stand with us to establish an international front against the religious-right and for secularism”, demanding “complete separation of religion from the state”, insisting secularism should be a “fundamental right”. It said, there should be a “separation of religion from public policy, including the educational system, health care and scientific research”, with “freedom of religion and atheism and freedom to criticise religions”. 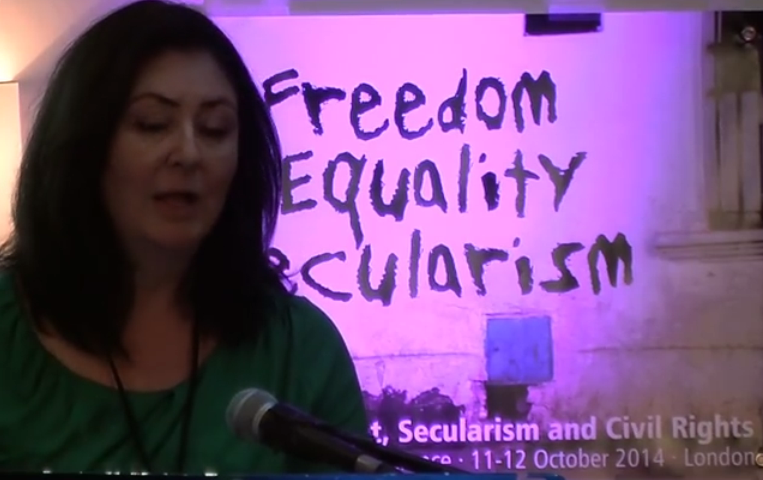 The conference was convened by Algerian sociologist Marieme Helie Lucas and Iranian-born campaigner Maryam Namazie, adopted the Manifesto for Secularism, highlighting “the voices of the many persecuted and exiled, the long standing resistance against the religious-right and the depth and strength of the demand for secularism all over the world despite grave risks. It also set the stage for the development of a broad international front for secularism to challenge the religious-right, racism and all forms of bigotry”. Religious dogma has its counterparts in the ideological dogma of secular power groups operating in every nation that have far-left leaning social and political theories. Intolerance is fermented by extremists in every persuasion of ideas. The goal should be to identify extremism, not religious dogma, and to create a benchmark for criminalizing the instance of political extremism in both liberal and conservative Governments, secular and religious. I regard the Western Oligarchy run by UK, European and US administtations as the most terrifying of all forms of nationalism in the world because of its economic stranglehold globally and its ability to create war economies that are capable of creating World Wars. The focus should be on the Oligarchic nature of the Industrialised West. Not on Islamic fundamentalism or terror. I argue for the Criminalisation of All Military Regimes in every country on this planet and for the immediate destruction of all weapons manufacturing as a pre-requisite for political progress of any kind to take place towards creating a moratorium on defining the meaning and purpose of secular government/society. Capitalism needs redefining as a social function more and economic function less. Religion is embedded in the history of Empire making, and the making of a successful Western Hegemony - soooo many political theorists overlook this fact and fail to point an accusing finger at their own history..